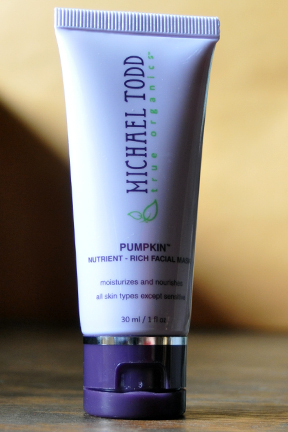 THE SKINNY: This facial masque looks and smells like real pumpkin. Not a spicy pumpkin pie smell. Just the pumpkin. It's a little off-putting. It goes on thin and has about the same consistency as canned pumpkin. This masque was a little hard to rinse off and left my face feeling sticky, even after I used cleanser to try to remove the last of the pumpkin goo. I've been a little itchy after using it, and my skin doesn't look any different. KEEP OR TOSS: Toss. Weird smell + weird burning sensation = thumbs down. CHECK IT OUT: Find more details on the Michael Todd website.